The John F. Kennedy School of Government at Harvard University has named convicted felon and transgender activist Chelsea Manning as a visiting fellow at its Institute of Politics for the 2017-18 academic year. Harvard's announcement of its incoming class of visiting fellows at the Institute of Politics celebrates Manning's inclusion as the program's "first transgender fellow." The Kennedy School describes Manning in its press release as "a Washington, D.C. based network security expert and former U.S. Army intelligence analyst." "She speaks on the social, technological, and economic ramifications of Artificial Intelligence through her op-ed columns for the Guardian and the New York Times," the announcement says. 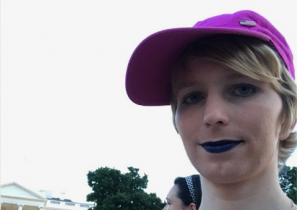 "As a trans woman, she advocates for queer and transgender rights as @xychelsea on Twitter." The description also mentions Manning's imprisonment for leaking troves of classified U.S. documents, before former President Barack Obama commuted most of her 35-year sentence in January. "Following her court martial conviction in 2013 for releasing confidential military and State Department documents, President Obama commuted her 35-year sentence, citing it as ‘disproportionate' to the penalties faced by other whistleblowers," Harvard's announcement says. "She served seven years in prison." Manning's Twitter page, which Harvard specifically referenced, currently has her pinned tweet as a call to "abolish the presidency." Other visiting fellows for this academic year include former White House press secretary Sean Spicer; Hillary Clinton's 2016 campaign manager, Robby Mook; and Kansas City, Mo. Mayor Sylvester "Sly" James, Jr. (D.). The Institute of Politics' acting director, Bill Delahunt, celebrated the diversity of viewpoints represented in the new class of fellows. "Broadening the range and depth of opportunity for students to hear from and engage with experts, leaders, and policy-shapers is a cornerstone of the Institute of Politics. We welcome the breadth of thought-provoking viewpoints on race, gender, politics, and the media," Delahunt said.